The Apso, as he’s known in his homeland of Tibet, is dignified yet mischievous. His alert and somewhat suspicious nature make him an excellent watchdog, and indeed that was his purpose for centuries. He has a long, flowing coat that requires extensive grooming. Hailing from the Himalayan Mountains, the Lhasa Apso was meant to guard and protect Tibetan monasteries and Buddhist temples. 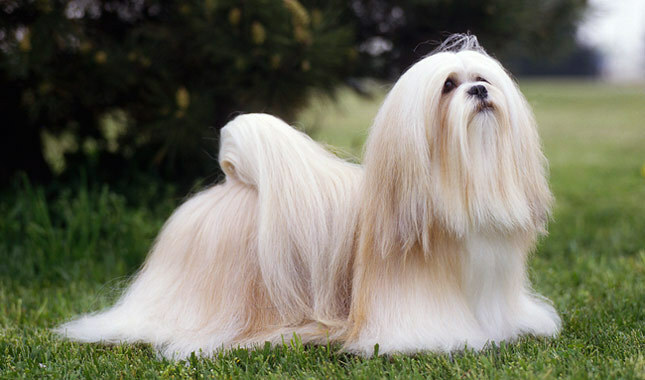 Named after the city of Lhasa, the breed was considered sacred. 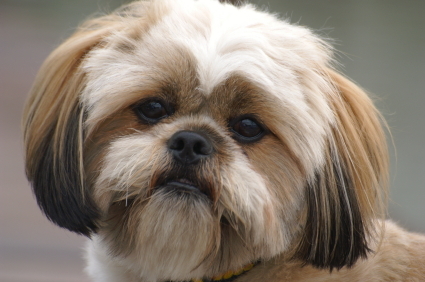 Gifted to the U.S. from the Dalai Lama, the Lhasa Apso became a loving household breed. Intelligent and loyal, this is a great breed for single adults or older children. If you are considering a Lhasa — and many find his looks irresistible — you must consider this breed's protective nature. Early socialization and training are absolutely critical to a Lhasa's success as a family member, so that he can properly direct his natural tendency toward wariness. The time invested in training him, however, is well worth your effort in terms of the loyalty, joy, and companionship that this long-lived, hardy little dog provides. It goes without saying that the Lhasa Apso, which was bred exclusively as a companion dog, needs to live in the house and never outdoors. The Lhasa is highly independent; his aim is to please himself, not you. The Lhasa is a leader, and he'll be your leader if you allow him to. The Lhasa is a naturally protective watchdog. There's no changing this, though you can teach him good canine manners. Early, positive socialization is essential to help him become a friendly, sociable pet. The Lhasa matures slowly. Don't expect too much too soon. The beautiful Lhasa coat needs a lot of grooming. Expect to do a lot of work, or to pay a professonial groomer. Dental care is essential. Brush the Lhasa's teeth regularly, and have your veterinarian check his teeth and gums periodically. The Lhasa comes from Tibet, and he takes his name from the holy city of Lhasa. For thousands of years, the Lhasa was bred exclusively by nobility and monks in monasteries to act an inside guard and protector. He's known in his homeland as Abso Seng Kye, which translates as "Bark Lion Sentinel Dog." The Lhasa's thick coat is protective; his native climate is one of intense cold and extreme heat. Recorded history of the breed goes back to 800 B.C. A Lhasa was considered good luck, but it was nearly impossible to buy one: he was a watchdog in temples and monasteries and was therefore considered sacred. It was thought that when an owner died, the human soul entered the body of his Lhasa Apso. Lhasas were not allowed to leave the country except when given as gifts by the Dalai Lama. From the beginning of the Manchu Dynasty in 1583 until as recently as 1908, the Dalai Lama sent Lhasas as sacred gifts to the Emperor of China and members of the Imperial family. The Lhasas were always given in pairs and were thought to bring with them good luck and prosperity. The first Lhasas to enter the United States directly were given as gifts by the 13th Dalai Lama in 1933 to C. Suydam Cutting, a noted world traveler and naturalist. Cutting owned Hamilton Farm in Gladstone, New Jersey, and the two gift dogs became the foundation stock for his kennel. The American Kennel Club accepted the Lhasa Apso as a breed in 1935. The perfect Lhasa doesn’t come ready-made from the breeder. Any dog, no matter how nice, can develop obnoxious levels of barking, digging, countersurfing, and other undesirable behaviors if he is bored, untrained, or unsupervised. And any dog can be a trial to live with during adolescence. Start training your puppy the day you bring him home. Even at 10 weeks old, he is capable of soaking up everything you can teach him. Don’t wait until he is 6 months old to begin training or you will have a more headstrong dog to deal with. If possible, get him into puppy kindergarten class by the time he is 10 to 12 weeks old, and socialize, socialize, socialize. However, be aware that many puppy training classes require certain vaccines to be up to date, and many veterinarians recommend limited exposure to other dogs and public places until puppy vaccines have been completed. In lieu of formal training, you can begin training your puppy at home and socializing him among family and friends until puppy vaccines are completed. Talk to the breeder, describe exactly what you’re looking for in a dog, and ask for assistance in selecting a puppy. Breeders see the puppies daily and can make uncannily accurate recommendations once they know something about your lifestyle and personality. Whatever you want from an Apso, look for one whose parents have nice personalities and who has been well socialized from early puppyhood. The Lhasa Apso is known to suffer from a few health problems. For example, it is known to suffer from sebaceous adenitis, a hereditary skin disease that occurs primarily in Standard Poodles, but has also been reported in a number of other breeds, including the Lhasa Apso. They are also known to suffer from the genetic disease progressive retinal atrophy (PRA) which can render them blind. Responsible breeders have their breeding dogs checked yearly by a canine ophthalmologist to check that they are not developing the disease, which is heritable in offspring. Lhasa Apsos are also prone to eye diseases, such as cherry eye and keratoconjunctivitis sicca (KCS or dry eye syndrome). A 2004 Kennel Club survey puts the median lifespan of the breed at 14 years 4 months. UK vet clinic data puts the median at 13.0 years. The Lhasa is a great choice for people with limited space. He's well suited for apartment or condo living, though he does enjoy playing outside in a fenced yard. The Lhasa is content with several short walks each day. He is not high-energy dog, and he doesn't tend to bounce off the walls when cooped up on a rainy day. He's happy sitting in your lap, wandering around the house, playing with his toys, and alerting you to passersby. Housetraining the Lhasa can be challenging, so it's wise to crate train. Also, remember that this dog will likely take a long time to mature mentally. He may reach full size at one year of age, but his behavior will still be quite puppyish. Be especially patient during training — keep it positive and consistent, and be willing to go the long haul. Training requires a lot of patience and a gentle hand. Lhasas can be willful, and if they decide they don't want to do something, they simply won't do it. Harsh treatment will often result in the dog retaliating. Lhasas respond best to food rewards, short training sessions and varied routines. Absolute consistency is important when working with a Lhasa Apso as they will see your bending the rules as an invitation to walk all over you. The time it takes to train a Lhasa is well worth the effort. Once leadership is established and the Lhasa learns that there is food in it for him, will step up to the plate and perform the tasks at hand. Early and frequent socialization is important with this breed. They are naturally suspicious of strangers and this can get out of hand in the form of excessive barking and even nipping or snapping. It is imperative to teach a Lhasa to accept new people as welcome visitors. 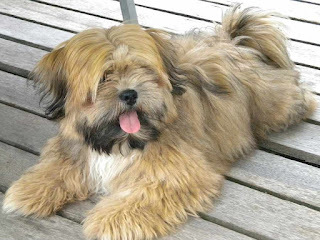 Lhasa Apsos have a moderate energy level, so it doesn’t need much exercise. That doesn’t mean your dog should nap all day – you want your pup to stay healthy, trim and fit. Take your Lhasa Apso for walk, let them scamper about and run free to play in the backyard. This breed loves to play fetch and will chase the ball until it gets tired out. 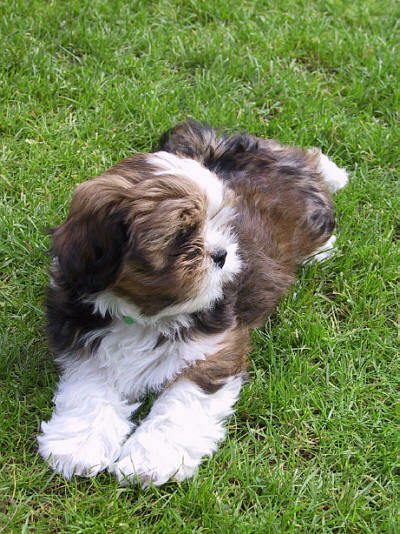 If you don’t have a backyard, don’t worry – your Lhasa Apso can exercise indoors. This breed doesn’t need a lot of space to move around, but your dog will need to get enough exercise every day. 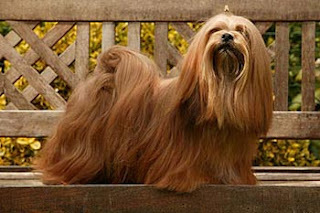 If you are looking for a dog with an easy-care coat, it’s safe to say that the Lhasa Apso is not the right choice. That glamorous Lhasa you see sweeping around the show ring is the product of endless hours of grooming. Even if your Lhasa will be a pet, his long coat will still need regular care. For a pet, expect to brush and comb the long, straight, heavy coat daily. When you brush, be sure you get all the way down to the skin. If you just go over the top of the coat you’ll miss many mats and tangles. Your dog’s breeder can show you the best techniques to use. The American Lhasa Apso Club also has good grooming advice. Pet Lhasas can be kept clipped short, but that still means frequent professional grooming. Neglected coats become tangled and matted, which is painful and can lead to serious skin infections. A Lhasa needs a bath at least every two to three weeks. The good news is that he doesn’t shed much, but you will still find a few hairs here and there. The rest is basic care. Trim the nails as needed, usually every week or two. Small dogs are prone to periodontal disease so brush the teeth frequently with a vet-approved pet toothpaste for good overall health and fresh breath. Children are probably not at the top of the Lhasa's list of favorite things. He tends to be intolerant of the normal antics of children, and he'll nip. 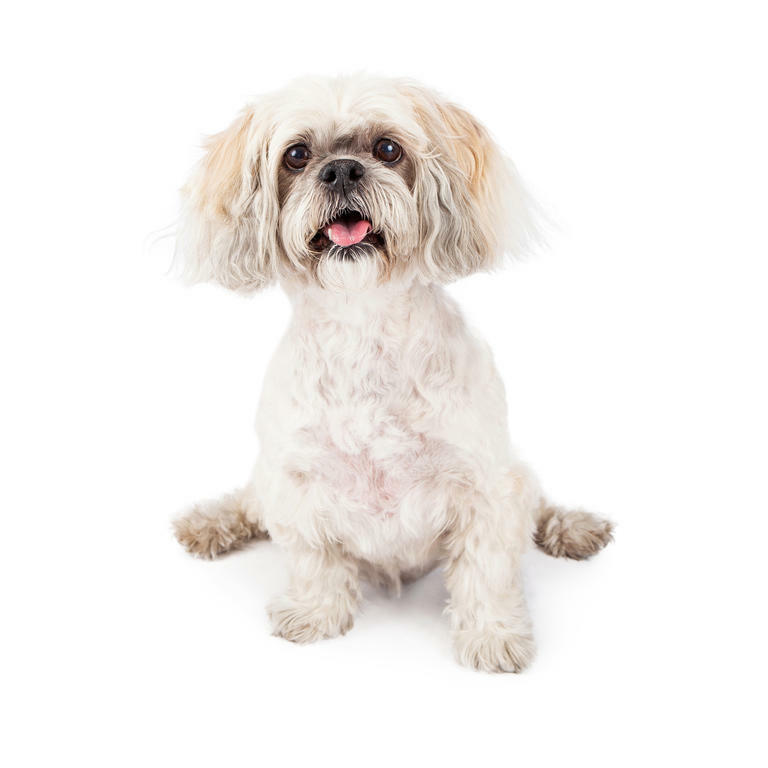 The Lhasa is best suited to a home with older children who understand how to properly handle him. He's not advised for a family with young or rowdy kids. If he's properly socialized and trained, the Lhasa gets along with other dogs. He does like to be top dog, so he's often the leader, even around other dogs who are much larger. He isn't afraid to join in activities normally associated with large dogs, such as hiking or cross-country skiing. The Lhasa thinks he's a large dog. The Lhasa can get along with other pets as well, given proper introductions and training. 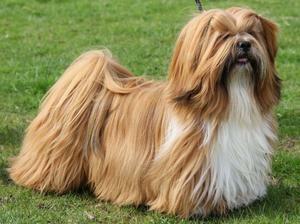 A kind yet sturdy breed, the Lhasa Apso is absolutely devoted to his master. A good guard dog, he is aloof with strangers and requires a good amount of training and leadership to avoid developing small dog syndrome. A bit impatient, he may not do well with young children but will get along well with other animals. Not requiring too much activity, he does well in apartments and is OK being indoors all day as long as he's kept in good company. Needing a lot of grooming, his coat can be trimmed down to avoid daily brushing. Lhasa Apsos were first bred 2,000 years ago by Buddhist monks in and around Tibet. The monks believed that when the Lhasa’s owner died, if he was not ready for Nirvana his soul would be reincarnated in the dog’s body. 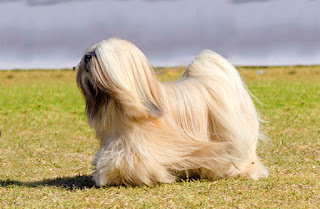 The Brazilian comic series Monica's Gang features a green-colored Lhasa Apso named Fluffy which belongs to Jimmy Five. In the animated series Spider-Man and his Amazing Friends, Angelica Jones/Firestar owns a Lhasa Apso named Ms. Lion. Lhasa Apsos have also appeared in at least two episodes of The Simpsons. In the episode "Three Gays of the Condo", Homer Simpson moves in with a couple of gay men. Homer started to act like a gay man and got a Lhasa Apso. Also, Milhouse Van Houten owns a Lhasa Apso. 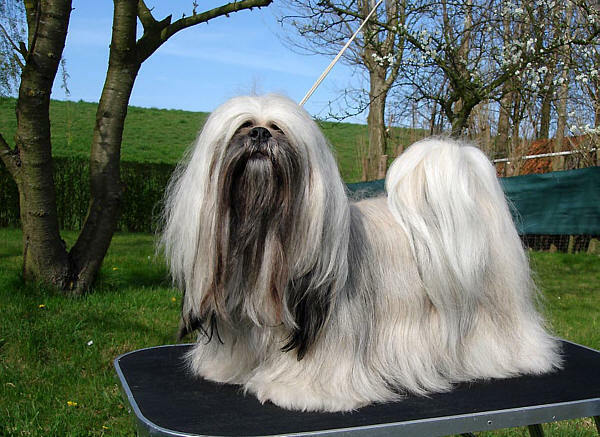 In the television series The L Word, Helena is assured by her wealthy mother that she was going to leave her inheritance to her, not to her Lhasa Apsos. Lhasa Apsos are said to bring luck, hence the saying "Lucky Lhasa". Singer Arturo Paz owns a Lhasa Apso named Coco. A Lhasa Apso is both a major character and a plot device in the 1948 children's novel Daughter of the Mountains by Louise Rankin . Reality star Bethenny Frankel has a Lhasa Apso named Cookie, who regularly appears on her show Bethenny Ever After. Science fiction author John Scalzi includes a Lhasa Apso named Tuffy in a pivotal role in the The Dog King, the seventh part of his episodic novel The Human Division. Writer Kurt Vonnegut lived with a Lhasa Apso named Pumpkin. Singer Barbra Streisand owned a Lhasa Apso, and dedicated her performance of "Smile" on the Oprah Winfrey Show to it, after its death. She even dressed up as her beloved pup for her 2013 "Halloween Bash" hosted by Patti LaBelle. Avant-garde art collector Peggy Guggenheim loved the Lhasa Apso breed so much, she has a burial site next to her own for her 14 "Beloved Babies" in Venice, Italy. Singer-songwriter Criss Starr has a Lhasa Apso named Mozart. The Hard Science Fiction Web Comic Freefall has Winston owning a Lhasa Apso called Beekay. A simple breed, the Lhasa Apso requires little to be a happy dog. Loving constant companionship, he will be all smiles as long as he's in his owner's company. Keeping an eye out on the house, he'll guard his space and owner throughout the day. An affectionate dog, he will be sure to cuddle close with a lot of petting, rubbing and stoking and follow his master from morning until night.